Council Creek Terrace would be a less typical, attached-housing residential development in the city. Up to 56 townhouses on the northern edge of Cornelius could be approved for development as soon as next Tuesday, Jan. 22. 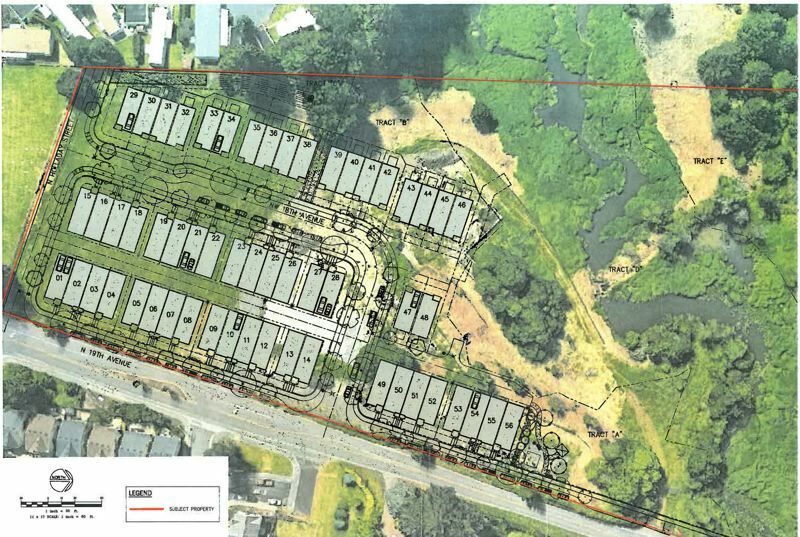 The city's planning commission is expected to consider a conditional use request and subdivision preliminary plat for Council Creek Terrace, which would be built on onetime industrial land on the west side of North 19th Avenue, directly north of North Holladay Street. A short extension of Holladay Street would also be built along the south end of the property as part of the project, as would a small city park alongside the townhouse development. The property in question is about 10.9 acres in size, although part of it is unbuildable, as Council Creek courses through its northern end. According to Ryan Wells, Cornelius' community development director, while the property was used for industrial purposes decades ago, it has been zoned for residential use for some time. No environmental cleanup is anticipated as part of the Council Creek Terrace development, he said. "It's nice that we're going to see this property develop," said Wells, who has been Cornelius' point person for development over a busy three years for the city. Council Creek Terrace is the seventh residential subdivision in development within the city of Cornelius, which is on track to grow from a population just under 13,000 to more than 16,000 over the next five years. Two other apartment complexes are also in progress, including housing for seniors on limited incomes above what will be the new home of the Cornelius Public Library on the corner of North Adair Street and 14th Avenue. Townhouses are also planned as part of the Laurel Woods mega-development in southeastern Cornelius. Construction has been going on at Laurel Woods for about a year. Once it is fully built out, that new neighborhood will include close to 900 single-family residences. "They're becoming more popular," Wells said of townhouses. He said he views them as a "more affordable" option than most single-family detached housing. Land use approval is required for work on the Council Creek Terrace subdivision to begin. The developer will need to obtain building permits from the city at a later date in order to start construction on the townhouses themselves.